A character in DBZ is never truly death, however when Vegeta died twice in the series both times were significant. Those who don’t know who Vegeta is, he is prince of the fallen Saiyan race. As royalty he is rather arrogant and prideful. He began the series as a cold blooded ruthless killer. Over the series Vegeta changes for the better and his two death’s are example’s of this change. The first death was at the hands of Frieza. When Goku arrived Vegeta tearful explained the horrible treatment he received at the hands of Frieza. This was an important changed in his character. Showing his vulnerable side (just before he was killed) made him more sympathetic. His second death was more of a suicide in order to save earth. In his fight against Majin Buu he is rather easily defeated. In a last ditch effort to stop Buu he decided to sacrifice himself. 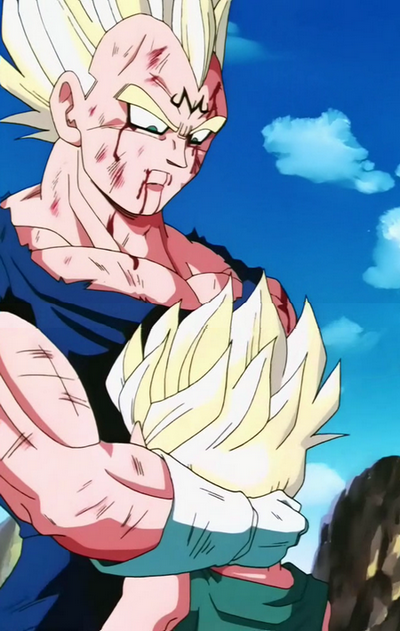 Vegeta hugs his son goodbye, a sign of love he rarely shows and proceeds to use his “Final Explosion”.